Home > MMDU Mullana > Cultural > UniversuMM 2018 Preview: What can you expect? The biggest event of the year is around the corner! 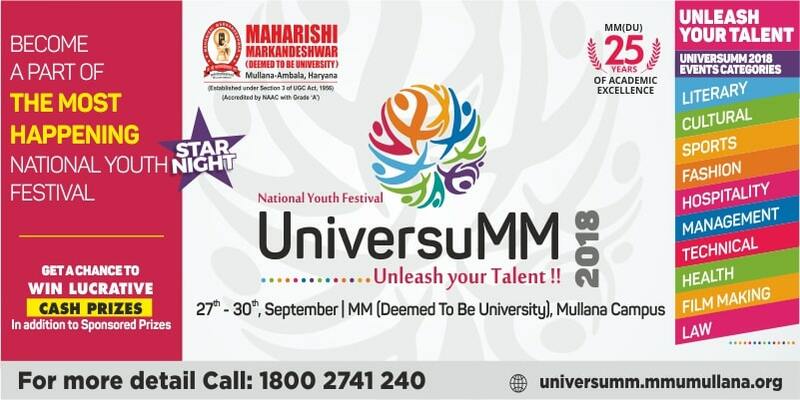 MMDU’s annual Youth Fest is the most important event in the University calendar, and it begins on 27th September 2018. Aside from star night, what’s on tap? Here’s everything you need to know about UniversuMM 2018. UniversuMM over the years has become grander as the University goes on to add more and more events to the menu. And this year, it is expected that students are all set to rock the stage with their electrifying performances to take the UniversuMM fest to the next level. UniversuMM 2018: When and where it is? The four-day extravaganza is scheduled to start on Sept 27 at Maharishi Markandeshwar (Deemed to be University), Mullana. Thousands of students from various regions of India will descend to MMDU campus for participating in the event. UniversuMM 2018: Who can participate? The event is open to all the students from recognized and certified Universities, Institutions, Schools, Academies, and Clubs. The University team will, no doubt, be on its toes to cater the needs and requirements of all the participants. Ranging right from literary to law, there will be 100 events, in total, for the participants to show their talent. Read on to know a bit about the National Level Youth Fest. Literary: This category will cover a myriad of events for those who believe themselves as brainiacs. Cultural: The category is destined to get the attention of those who have a passion for Music, Dance, Theatre and Fine Arts. Fashion: This grouping is for those who have a penchant for glamour world. Be the showstopper! Can you? Photography & Film Making: For photography enthusiasts, there’s no better place than the UniversuMM stage to show what talent they have in store. Sports and Games: This category will give you a chance to show your stamina and strategies in games like Badminton, Chess, Squash, Tug of War, Cricket, Table Tennis, Volleyball, and Basketball. Technical: The category challenges the students who want to become leaders in a digital age. Will you? Business: This category is to encourage students to come up with innovative ideas for winning various events. Hospitality: This competition is an opportunity for students to show their exemplary performances in different categories like Flower Fantasize, Dress a Cake, Towel Art Competition and many more. Health: The category is for those who want to test their knowledge of healthiness as well as promptness alike. Law: This competition is to test the skills expected of students who want to become solicitors or barristers. In this, participants have to put their wits on the test and have to prove their ability to think under pressure and subject to time constraints. UniversuMM will be incomplete without the Start Night though which celebrity will burn the stage during the event is a suspense for now. You are suggested to stay tuned to get all the latest updates on UniversuMM 2018. Can you steal the show and put your competitors in the shade? If yes, why wait? Impress the audience with your exhilarating performances at the fest. What you can do is visit UniversuMM page by clicking https://universumm.mmumullana.org and check out the theme of this year’s UniversuMM event, registration process, and guidelines that are lined up. No documents needed. You have to bring your identity card. Hello! I’ve been reading your site for some time now and finally got the bravery to go ahead and give you a shout out from my side! Just wanted to tell you to keep up the fantastic work! visit at the website, that’s what this web page is providing. Appreciating the commitment you put into your site and in depth information you offer. It’s awesome to come across a blog every once in a while that isn’t the same unwanted rehashed material. I often read and share your content. but I prefer the content written on this blog. Now this post is very useful, I often visit and read posts here. on this blog. The content is really good! This piece of writing is actually a nice one. Remarkable! I am very happy to see your article. this is a fantastic blog. A great read. You have touched some nice factors here. Anyway, keep up writing. hi!, I like your writing very a lot! I believe that you should write more about this topic, it may not be a taboo subject but generally, people do not discuss such subjects. To the next! Cheers!! A great web site you’ve got here… It’s difficult to find high-quality writing like yours these days. I would like to say terrific blog! shout out! Just wanted to mention keep up the great work! I read this post it’s a remarkable article. This paragraph offers a clear idea in support of the new users of blogging, that genuinely how to do blogging. Magnificent items from you, man. I have been mindful your stuff previous to and you are simply too excellent. I am genuinely happy to read the write-up and the way it is written. I seriously love your blog. Excellent colors; theme.